Welcome to "On The Button"
A great day for the Wilts & Berks Canal Trust: supporters, funders, landowners and the public gathered by the Wilts & Berks canal at Studley Grange between Royal Wootton Bassett and Swindon for the formal opening of a new section some 1.2 km in length. 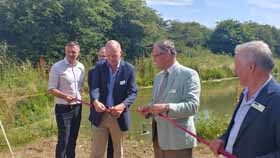 Chair of Wilts & Berks Canal Trust, Roderick Bluh, Chair of Viridor Credits Board Peter Renshaw and fellow Trustee David Robertson, together with Biffa representatives’ Nick Emery National Estates Manager and Dean Willett formally opened this newly restored section of the Wilts & Berks canal. Also joining in the celebrations were Mayor of Royal Wootton Bassett Mike Farrow, Chair of Wiltshire Council Cllr Alison Bucknall, Deputy Leader Vale of White Horse District Council Cllr Ben Mabbet and Chair of The Wiltshire, Swindon & Oxfordshire Canal Partnership Fleur de rhe Philipe. Also present were contractors, project managers, members of the public who had contributed to the project, WBCT members and volunteers and many local people who have all helped to bring this dream to reality. The entrance to the Studley Grange can be found off Bincknoll Lane at Chaddington Lane Bridge, Royal Wootton Bassett, SN4 8QR. 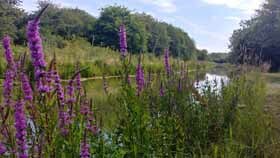 The towpath is subject to closure at short notice to allow the adjacent landfill site to undertake maintenance operations as needed. Dave's team are getting ever closer to the winning post... the day the 'pub with no beer' becomes the 'pub with beer'. 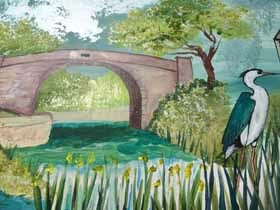 Recently supporter and Transitions Project partner Marilyn Trew created some friezes for over the small bar showing scenes from the canal from West to East. You may remember Marilyn from last year when she painted the Boat Trip sign for the Dragonfly boat team. Another lovely piece of work Marilyn... thank you! WBCT Wheelyboat was seen in June on Coate Water in Swindon taking part in the Dragonboat Festival on 25th June... not in fact racing, but instead acting as a water taxi. She and her crew joined Swindon Branch members who were based on land with the Trust gazebo helping to promote the Trust. 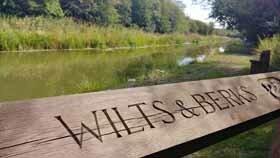 Coate Water, a reservoir, was once an integral part of the Wilts & Berks canal. 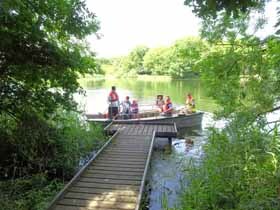 The reservoir formed a 70-acre lake, built in 1822 by diverting the River Cole. Its primary purpose was to provide water for the canal and it remained outside the borough of Swindon until the borough's expansion in 1928. Our facebook page is a real winner for us in giving us a quick and effective way of communicating with all those interested in the happenings at the WBCT and along the canal... and receiving messages back from our supporters. We are up to 2201 likes and have a monthly reach of well over 10k. Why not join in and like our page to make sure you get the latest news as it happens. 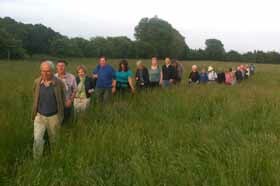 In late June and through to early July WBCT Vice Chair Brian Stovold led his now traditional evening walks around the canal and the lost pubs of Wantage, all part of WBCT East Vale Branch efforts to support the Wantage Summer Festival. He’s been leading these walks for a number of years now and reports that they are popular and very successful, giving a great deal of information out to many about the canal through history and our work today in restoring and improving habitats for everyone to enjoy. He can try the Peterborough Arms soon! 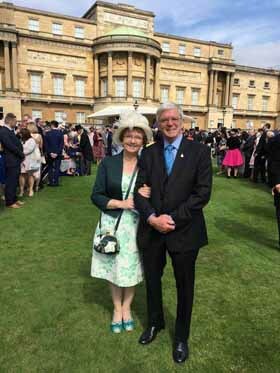 “The Trustees had no hesitation in recommending Dave Maloney, Chair of Melksham Chippenham and Calne Branch, Executive Manager and long- time volunteer leader of the Peterborough Arms refurbishment project team. Dave personifies volunteering... hardworking, dedicated, a team player, careful and cautious when spending our hard raised public funds... and inspiring and leading from the front in times of need. Dragonfly will be back with us in August with a bumper summer edition full of in depth articles about all things canal: the new editorial team led by Patricia Clements, Head of PR, Communications, IT & Administration is working hard on copy, images and design for a new look Dragonfly... with the old favourites as well... watch this space for a preview in the next OTB. 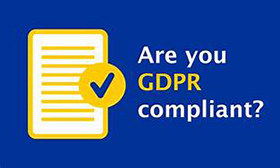 More information and book in with patricia.clements@wbct.org.uk as places are limited at the venue.